A tapered square wood tower 38 feet high, painted white with a red lantern. The little "pepper-shaker" style lighthouse at the narrow entrance to Ingonish Harbour first shone its kerosene light in 1887. Although the harbour entrance is sheltered from the brunt of Atlantic seas, the passage has always been narrow and tricky to navigate. The new light must have been a welcome sight to mariners of the day. 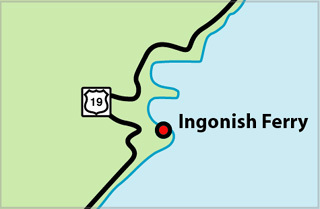 In the late eighteenth and early nineteenth centuries Ingonish Harbour was home to many schooners and smaller vessels engaged in the fishing trade. The original schooner Bluenose was known to visit the port on her many voyages to the Grand Banks, and no doubt her captain was welcomed to the harbour by the little light. 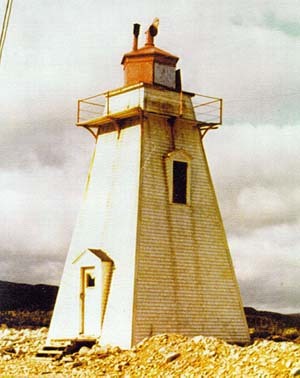 Over the years, the light became a familiar landmark and it was well maintained by a number of keepers, the last of whom was Donald MacKinnon Sr., or "Big Donnie" as he was affectionately known. The light was decommissioned by the Department of Transport in 1956 and replaced by an electric light on a skeleton tower complete with daymark. The lighthouse stood in various stages of disrepair for many years. During 1969-1970 the building was leased to an individual who did some renovations on the tower. But the lighthouse was soon abandoned again. On the morning of October 26, 1983 the people of Ingonish awoke to a horrendous sight. During the night, either a tidal wave or a spring tide of unprecedented height had wrecked most of the wharves, buildings and boats along the shore of the harbour. One estimate had the water level 11 feet above high water mark at its peak. One of the many victims of this disaster was the old lighthouse. Only four years away from its 100th birthday, the structure had been carried off its foundations and smashed on the shore a half mile away. As part of the site clean-up the Department of Transport sent a contractor to remove the lighthouse foundation. The foundation consisted of stone and mortar walls, with a concrete slab floor. In the process of uprooting one of the cornerstones, a worker noticed an object lying in the rubble. It was an unusual metal statue. The small figure was two-faced and appeared to be of East Indian origin. One face is that of the Hindu god "Brahma" (supreme eternal deity). The other is of "Ganesh", god of knowledge, wisdom, literature and fire. Where could this statue have come from and why was it placed under the lighthouse? The statue was assessed by an individual from Harvard University and estimated to be 500 years old. Could this have been brought over on a ship in John Cabot's time? For many years during the age of sail, ships were known to carry Indian sailors as part of their crew. They had a reputation for being very capable mariners. Could this statue have come from such a ship? Why was it placed there instead of Saint Elmo (patron saint of sailors), as Ingonish in 1887 was a community of Christian beliefs. Another interesting aspect of this mystery is the spelling of the god "Ganesh". Does it have any connection with In-gonish? It is a fascinating piece of our lighthouse history. Today, the statue remains the property of the man who found it. If only it could talk.